Thanks for joining, Bellezza. I think what I like most is that there is the possibility fro redemption – for Scrooge but not for Marley. Or maybe, but we are not told, in warning Scrooge, Marley can better his fate as well? The ending is really perfect as well feel how sunny a day it is, how Scrooge starts to enjoy life for the first time in years and that he will make things better for himself and others. The first time I read it I was completely absorbed by the descriptions, this time, like you, I was comparing myself. I suppose you could say I was comparing myself to the story, but while writing the post I was thinking more about the general state of mankind. At any rate, it's a good reminder that we are what we do and say. I always want to be a blessing to others. I always want to shed light rather than despair. 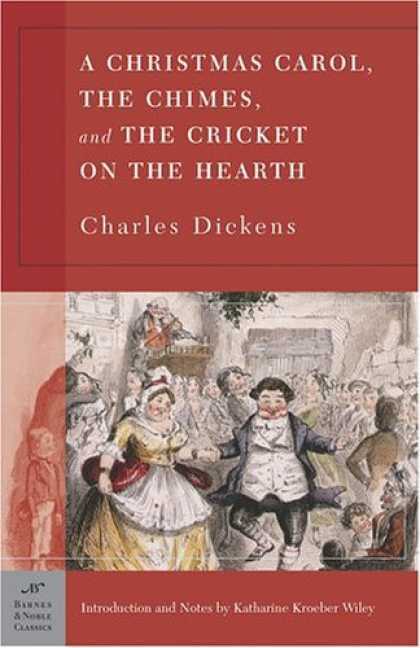 I loved reading Dickens this month. I also read The Chimes though I haven't posted on it. Thanks for the inspiration to do so! What a wonderful review! I found that scene at Fred's house disturbing, it was in fact my least favorite part of the story. Funny, but not in a good way. I do love the descriptions in this novel, but I have to agree with you, this story made me think of my own life. How long would my chain be, if I have one. No one is perfect, but we can all try to be better. I love the idea of redemption in this book as well–that we have the power to forge ahead and make better the mistakes that we have made in the past. While there isn't much we can do about the things we have done or the things we have said, we can do a great deal about what we do today and tomorrow. 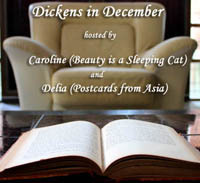 I'm glad Delia and Caroline hosted this readalong. I signed up to reread it but didn't – just not in the mood. Did spend a few minutes watching some of the George C. Scott film, however. Poor Scrooge, yes, he is redeemed but still there is a ton of life he jettisoned that he will never recover (although there may be some compensations) and the pain of those losses will remain. It's true – reading this – you definitely can't help thinking about whether you're a good person or not. Sometimes we're just so caught up in life and getting through each day that it's a bit like we forget to enjoy it and forget to share it with others. This book makes you wonder if you could be better and that's not really a bad thing.